Please join us as we congratulate our three top winners of the second round of the Write Start Contest! T.M. Hayes has been placed as the Grand Prize Winner. He will receive a one-on-one phone consult with a top exec in the industry. All three winners will receive Platinum Passes to the Screenwriters World Conference 2015. Before you submit your one-sheet to The Write Start Contest, check out our new ScriptXpert Screenplay One-Sheet Critique service! Submit with confidence after a professional review! Have an idea for a screenplay? 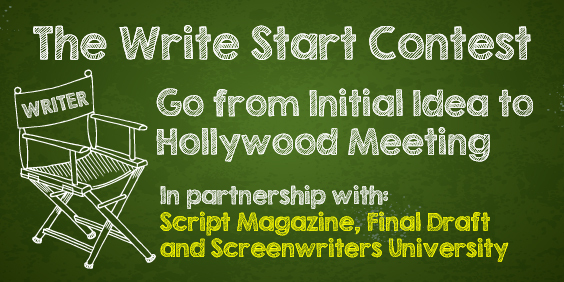 With the Write Start Contest, that’s all you need to get started on your Hollywood career! This international competition challenges you to produce a One-Sheet, using our free How to Write a Screenplay One-Sheet tool as a guide. Enter this summary of your script idea in the Write Start Contest, and you could see your work go in front of top Industry Insiders, and be crowned the top winner. The Write Start Contest has a total prize package valued at more than $10,000 and invaluable Industry access! Step 1. Enter today to take part in the Write Start Contest, and submit your entry anytime before the final submission date. Securing your entry today is a great way to motivate yourself to get down to writing! Step 2. Create a "One-Sheet” using our free How to Write a Screenplay One-Sheet Guide. And take your time—once you’ve signed up and submitted your entry fee, your One-Sheet isn’t due until the final deadline. 10 finalists will be chosen, and each will receive Final Draft 9 and enter into a 6-week Screenwriters University writing program, where they will develop their One-Sheets into screenplays. The course begins in January 2015. The completed screenplays will receive ScriptXpert Extended Coverage/Development Notes, and finalists will have two weeks to make the suggested edits and complete the final draft of their scripts for judging. Our team of Industry Insiders evaluates the completed screenplays and chooses a top three, all of whom will receive Screenwriters World 2015 Platinum Passes. The Grand Prize Winner also meets by phone with an executive, who will provide feedback on the screenplay and career advice. The Write Start Contest is open to all genres, and has a budget-friendly $20 submission fee. So what are you waiting for? Enter your One-Sheet today! Looking for the regulations and answers to specific questions? Check out The Write Start's Contest’s FAQs.